This tree was positive for Prunus necrotic ringspot virus. Note the necrotic ring spots on this Kwanzan flowering cherry. Photo by Melodie Putnam, 1997. 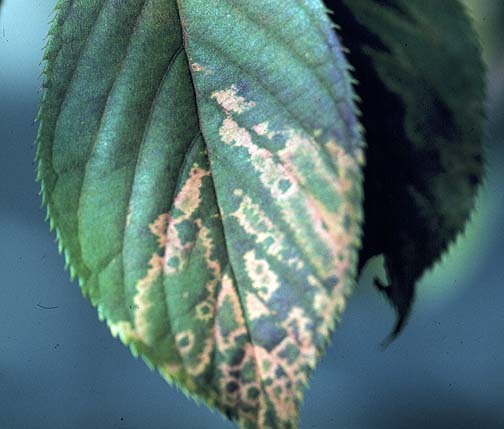 Cause Prunus necrotic ringspot virus (PNRSV), which has many strains that have produced variously named diseases over the years including necrotic ringspot, tatter leaf peach ringspot, recurrent ringspot, cherry rugose mosaic, rose mosaic, and almond calico. PNRSV is responsible for yield losses of up to 15% in sweet cherry and up to 100% in peach. PNRSV can reduce bud-take in nurseries, decrease growth of fruit (10% to 30%) and fruit yield (20% to 60%), delay fruit maturity, and increase susceptibility to winter injuries in orchards. The PNRSV is transmitted easily by budding and grafting. It also spreads naturally in the orchard by infected pollen. Thus, there is little spread until trees are old enough to bloom. In the Pacific Northwest, most orchard trees are infected with PNRSV by 20 years of age. Spread in sweet cherry is much slower than in sour cherry. Due to pollen transmission, a high percentage of the seed may carry the virus. PNRSV infects naturally all Prunus spp. including both cultivated and wild species but also hop and rose. Symptoms Shock symptoms, followed by chronic symptoms, are produced in trees not already infected. The occurrence of shock symptoms apparently depends on climatic conditions. The number of virus strains and the difference in tolerance of host species results in unlimited variations in symptoms. Symptoms generally consist of chlorosis, necrosis, leaf deformity, and stunting. Entire plants may be affected, or only a portion may show symptoms. Normal PNRSV symptoms consist of a few rings or chlorotic areas that may develop into severe necrotic spotting and a shothole appearance. 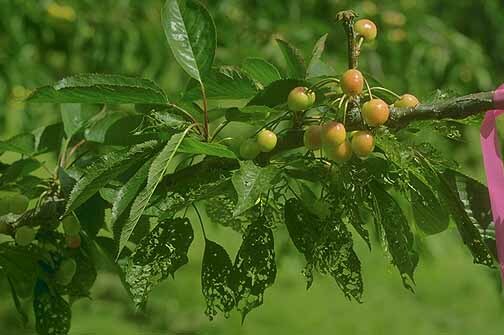 Careful inspection of sweet cherry trees in late spring may reveal scattered older leaves or entire spurs with necrotic spotting or etched rings. Sometimes one branch will show tattered leaves or symptoms of the rugose mosaic strain. Yield on trees infected with the normal strain is reduced about 5%. The cherry rugose mosaic strain produces "boating" and turned-up leaf tips, delayed fruit maturity (up to 3 weeks), and enations (ridges of rasp-like growth) on undersides of leaves. Leaves with enations are often thicker and stiffer than normal leaves. Severe monetary loss occurs from delayed maturity of the fresh market cultivars such as Bing and Lambert. Smaller losses occur from the delayed maturity of fruits for the brine trade. Trees infected with the rugose mosaic strain set a very light crop that matures late. Use nursery stock that has been tested and found to be free of all known viruses. If propagating your own trees, use both virus-indexed bud wood and virus-certified rootstock. Infected pollen should not be introduced into healthy orchards during pollination. Establish new plantings in blocks, the larger the better, and preferably at some distance from older orchards. Rogue infected trees in new virus-indexed orchards, but it is not economical to rogue or replant mature infected orchards unless trees are infected with the rugose strain. Complete orchard removal should be considered. References Oliver, J.E., Freer, J., Andersen, R.L., Cox, K.D., Robinson, T.L., and Fuchs, M. 2009. 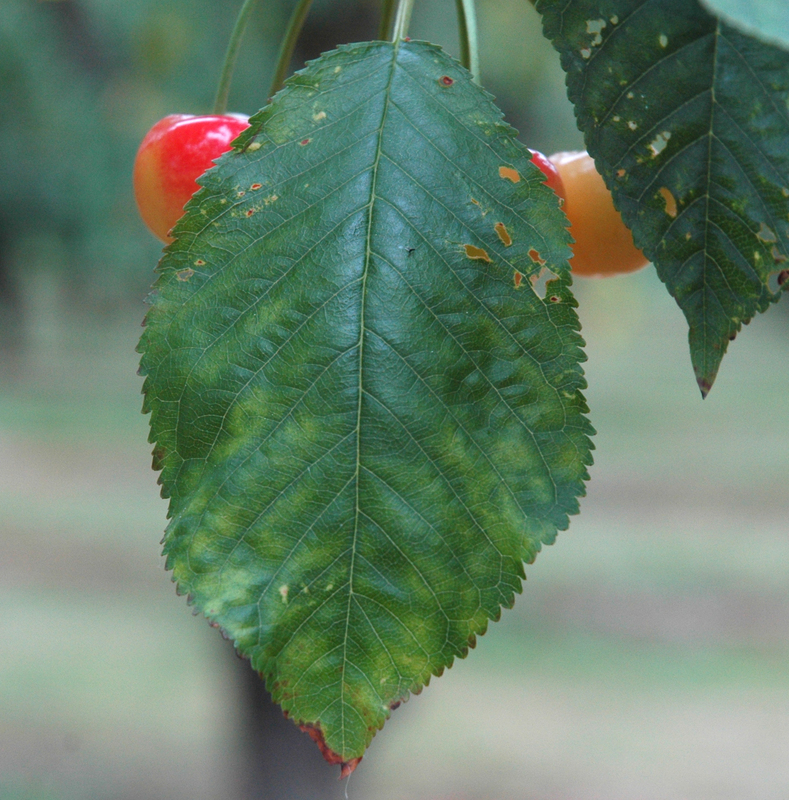 Genetic diversity of Prunus necrotic ringspot virus isolates within a cherry orchard in New York. Plant Dis. 93:599-606. Pallas, V., Aparicio, F., Herranz, M.C., Amari, K., Sanchez-Pina, M.A., Myrta, A., and Sanchez-Navarro, J.A. 2012. Ilarviruses of Prunus spp. : A continued concern for fruit trees. Phytopathology 102:1108-1120.